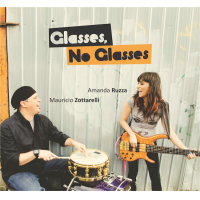 Brazilian-born Amanda Ruzza began playing bass guitar when she was 12 years old, developing a mastery for the instrument, moving to New York City and, since then, playing a variety of styles of music with such groups as Global Noize and the Chris Stover's Caetano Veloso Project. This Is What Happened is the young artist's debut, featuring original compositions infused with elements of hard funk, jazz, Brazilian and other South American rhythms. The result is a very modern and upbeat sound, with enough of a funky twist to make it a unique musical experience. With the sounds of the electric guitar, Fender Rhodes, and soprano and alto saxophones in the mix, Ruzza's preference for the electric over the traditional acoustic bass voice is a perfect choice for the modern music on this stellar recording. Its funky flavor is evident right from the beginning, with veteran alto saxophonist David Binney, pianist Mamiko Watanabe and Ruzza's hard-driving bass line at work on "Larry and I." Ruzza's talents with the pen come to the fore in her Brazilian arrangement of the choro-styled "Pagao"the only standard of the album, taken from the great Brazilian composer Pixnguinha. The electric vibes reverberate on the hauntingly simple but beautiful "Monday, 3 A. M."one of the disc's brighter momentswhere the sounds of bass, guitar and Rhodes provide a spark for another fine solo from Binney. After another Brazilian-tinged excursion on "Pimenta No Choro," Ruzza returns with funky revolutions on Watanabe's "Gin," with the pianist, trombonist Chris Stover and drummer Mauricio Zottarelli all revealing tasty lines of their own. More gyrating rhythms close the album on lively Brazilian-flavored title track, led by exquisite percussions and a splendid soprano solo from New York saxophonist Lucas Pino, who shares duties with Binney. A remarkable electric bassist with a certain charm distinguishing her technique and musical approach, Ruzza has taken a brilliant first step on This Is What Happened, a firm foundation for many electric moments to come. Track Listing: Larry and I; Pagao; Costanera; Monday, 3 A.M.; Pimenta no Choro; Gin; This Is What Happened. Personnel: Amanda Ruzza: electric bass; Mauricio Zottarelli: drums, percussion; Alex Nolan: electric guitar, acoustic guitar (1-4, 6, 7); Mamiko Watanabe: Fender Rhodes (1-4, 6,7); Cliff Korman: piano (5); David Binney: alto saxophone (1, 4), soprano saxophone (3, 7); Lucas Pino: tenor saxophone (3, 5, 7), soprano saxophone (2, 6); Chris Stover: trombone (2, 6).